Time to visit the second of four breweries in East Vancouver. It was just a hop and a skip from Storm Brewing to our next destination, but one glance at Parallel 49 Brewing told us that the two breweries could not be more different. 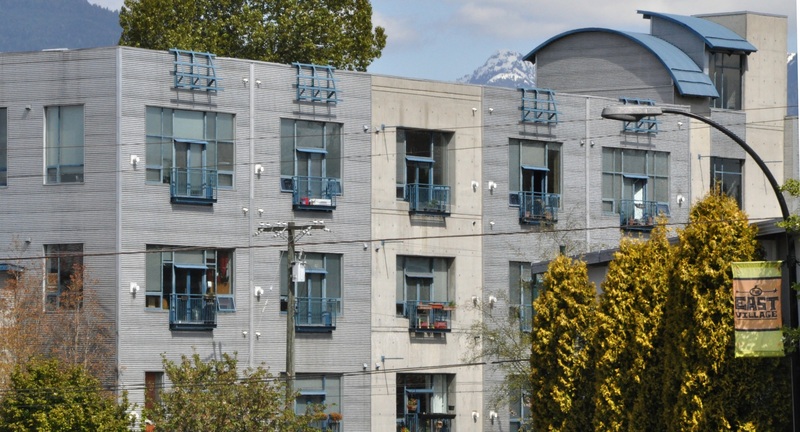 Corrugated steel-panelled condo marks gentrification of area while still paying tribute to gritty industrial history. This is still a very industrial part of town, but the corrugated metal “faux industrial”- style condo developments here and there and banners proclaiming “East Village” indicate that some gentrification of the area has started. 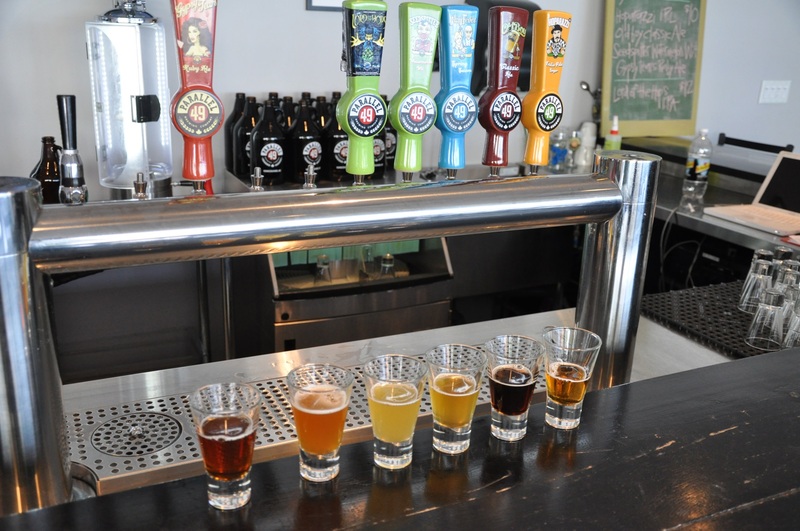 Parallel 49 Brewing (named after the nearby 49th parallel, which acts as the Canada-U.S. border in these parts) was started by three home brewers who were ready to step up to the big leagues. 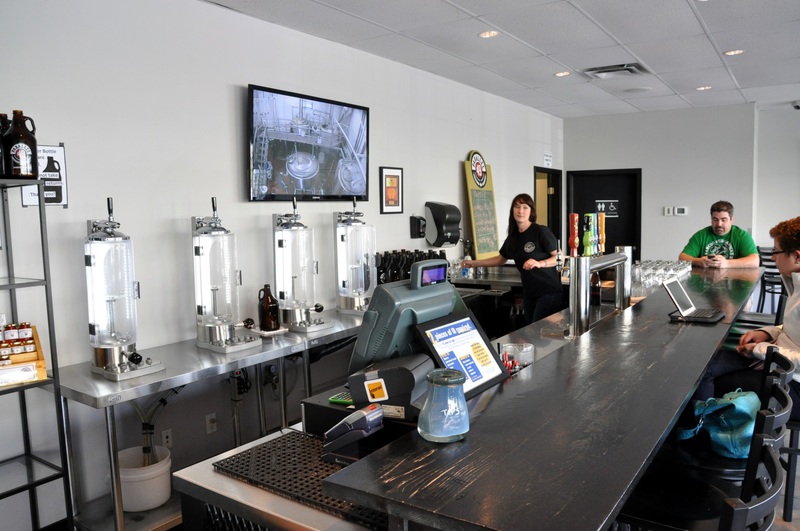 The brewery’s location in a sleek two-storey commercial building makes it obvious that a lot of professional planning — and a whackdoodle of cash — went into realizing their dream. Clearly the owners are gambling that this area will continue to attract more well-to-do people and their money. Live TV: Brewhouse operations on the flat screen TV. Behind the bar, four growler fillers lined the wall — like several other West Coast breweries we had already visited, growlers are obviously big business here too. In addition to a cooler with bottles, there was also a plethora of brewery-related swag, including beer jelly, beer soap, beer glasses and (of course) beer logo t-shirts. Lord of the Hops IPA: “One Beer to Rule Them All”, apparently. What would Frodo think? The beer samples covered a wide gamut, from a tasty ruby ale to a very hoppy India pale lager. Several really stood out. The Old Boy Brown Ale was nutty and smooth. The Seedspitter Watermelon Wit — yes, it tasted like fresh watermelon — was very light, dry and thirst-quenching. I can see of lot of it being consumed on Vancouver patios this summer. And it goes without saying that I enjoyed the Lord of the Hops IPA — with Ahtunam, Citra, and Amarillo hops, a very enjoyable example of the Northwest style. As I sampled, Angie filled us in on the brewery’s short history. On the day we visited, the brewery had been open almost exactly a year. The three homebrewers had originally been chemical engineers — perhaps their engineering degrees explained the high degree of attention to detail that we saw. They in turn had brought five other investors on board. 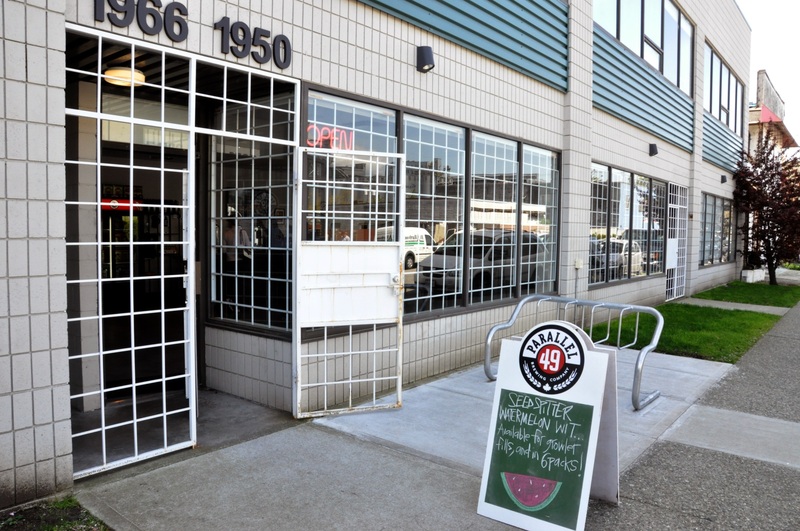 Their business plan clearly calls for Parallel 49 to be sleek, modern, and well-marketed. Custom embossed bottle with 1940s-style artwork. In addition to growler and keg sales, the brewery also bottles their product in custom 650 mL bottles with the company logo embossed above the label. In addition, most of the labels feature distinctive art in a 1940s cartoon style. The result is a very professional-looking and very recognizable product. Pretty impressive for a brewery just celebrating its first birthday. Fermenter farm. Not sure I have seen FVs scrunched so close together before. The upper catwalk is a nice touch. Unfortunately I didn’t arrive on the proper day for an official tour, but when Angie was unable to answer some of my more technical questions, she resourcefully snagged John, one of the brewer dudes, as he walked through the lounge. Fortunately John had just enough time in his schedule to take me on a behind-the-scenes look at the brewhouse and packaging area. 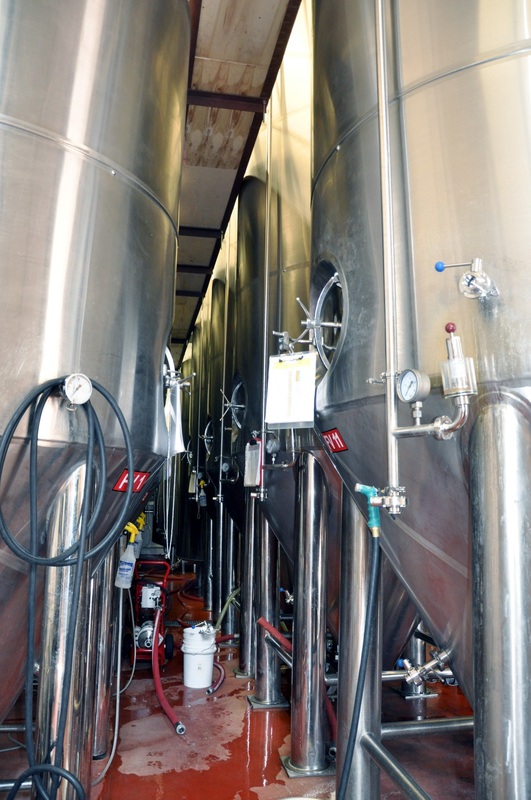 The brewhouse is a 25-hL example of stainless steel art. They had started with some 50-hL fermenters, but when demand outstripped supply, they quickly installed several 100-hL fermenters, each capable of holding a quad-batch. Perhaps the rapid pace of expansion explains why the fermenters were scrunched so close together. Glad I’m not the guy who cleans them — that would be a tight work space. John was an excellent host, and as we passed by a couple of fermenters holding special brews, he stopped to draw samples for me. Like I said, an excellent host. 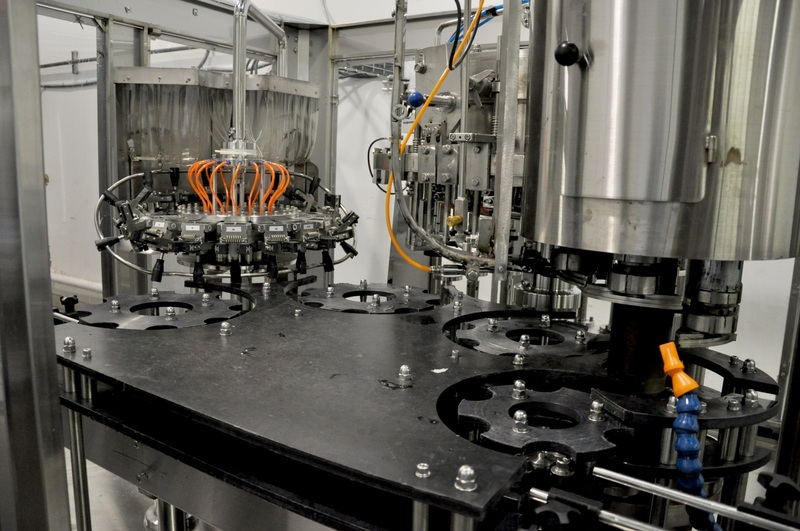 Bottle filler capable of filling and bottling 1800 bottles/minute–when it is working. We also took a look at the packaging line. The brewery uses a rotary filler capable of filling 1800 bottles per hour. (This is very impressive for a Canadian craft brewer.) However, the bottling machine had been purchased off-shore, and apparently it had taken considerable time and effort to get it working properly. I have heard similar stories at several other breweries — off-shore equipment purchased for a very good price that takes a significant amount of time to get up and running or causes a significant amount of down-time. My tour with John over, I returned to Angie (and my wife Elaine) in the lounge. Angie poured me another sample, this time of their winter seasonal, a salted caramel Scotch ale. Oh, my! A nose of brown sugar, a thick, rich mouthfeel, and the salty smooth taste of Mackintosh toffee. Angie apologized that this was the last of the batch — four or five bottles in the cooler was all that remained. Yes, I bought one of those bottles. No, I didn’t have room in my suitcase for it — I would just have to jettison some socks. This entry was posted on May 26, 2013 at 7:39 pm and is filed under Brewery. You can subscribe via RSS 2.0 feed to this post's comments. I’m really enjoying the recent Vancouver-area posts. I lived on Commercial Drive from 03-07 going to school before moving back to the US. Now I’m a brewer at Alaskan… Was hoping to visit for Vancouver Beer Week but couldn’t get away this time. Haven’t been back since 2009 and boy has the beer scene grown… I wish St. Augustine’s Craft Brew House existed when I lived on that block!